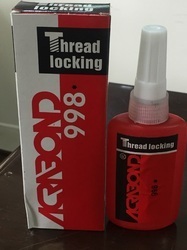 Providing you the best range of acrabond 24- nut locking anaerobic adhesive sealant, acrabond-348 bearing retainer and acrabond-998 locker washing machine with effective & timely delivery. Acrabond-24 is a special purpose single component, medium strength anaerobic NUT LOCKER. Grade 24 cures when confined in the absence of air between close fitting metal surfaces. It is formulated to lock metal fasteners and thus prevent vibration loosening and leakages through the threads. It is particularly suitable for M6~M8 threaded fasteners. 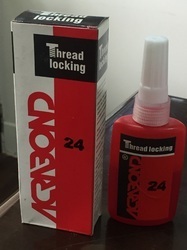 Acrabond-24 prevents corrosion of assembled parts. Acrabond 34 is an anaerobic type curing system used as a bearing retainer for shafts/housing bearing fixing, oversized keyways retention & locking threads as well. It cures when confined to area where air is absent IE between close fitting metal surfaces,threads and pins. It is formulated to lock, seal & fit metal fasteners requiring very high strength and thus prevent vibrational loosening and leakages through the threads. Acrabond 34 is particularly suitable for larger shafts & threaded fasteners. All different types of applications where high temperatures & maximum strength is expected. It also helps to increase corrosion resistance of assembled parts. The goodwill that we have gained in the industry is only due to our Acrabond Locker Washing Machine Specific Acrylic Adhesive. Offered adhesive contains synthetic resins and rubbers for its main ingredients. By one application, it prevents screws, nuts and bolts from getting loose, leaking and rusting. Screws, nuts and bolts are usually required to be taken off. And so, Acrabond locker is processed so as to be taken off at the time of maintenance or repair by a force 10% more than that for screwing. Cured Acrabond 998 is resilient and so resists vibration and impact excellently. Being low viscous, it penetrates into every corner of threads and prevents the screws, bolts from getting loose and leaking. Has excellent locking effect and yet can be taken off easily. Can be used for a wide rage of temperatures. Reduces frequency of quality claims resulting from loosening and increases reliance on machinery. Presents no fatigue and ageing as with washers and maintains lock in effect forever. Use of washers, split pins, double nuts can be discarded. devices were prepared to meet specific requirements. But Grade 998 can be used universally regardless of shapes and sizes of screws. Grade 998 can be used continuously even when designs of machinery are changed. No skills are required in application. Anyone can use it very easily. Remove moisture, grease and other foreign matter. Apply with brush onto threads. You may apply a single drop on the screw head after it is fastened as Locker- 998 penetrates into the threads or dip the threaded portion in Grade 998 and fasten it. To unlock a screw or bolt, apply a torque approx. 10% higher than that used for locking. Looking for Locking and Retaining Compound ?